The Los Angeles Dodgers had a rough April, and it’s about to get worse. 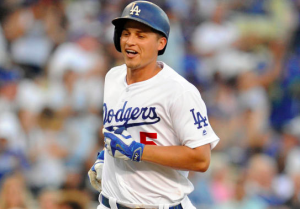 On Monday, the Dodgers announced that shortstop Corey Seager will miss the rest of the season because of a torn ulnar collateral ligament in his right elbow. The injury will force Seager to undergo Tommy John surgery, which will keep him sidelined for the rest of 2018. Seager’s elbow pain began toward the end of last season. He spent the winter attempting to strengthen the elbow, hoping to prevent a serious injury to the elbow. However, over the weekend, Seager felt numbness in that elbow while throwing the ball, prompting an MRI on Monday that revealed damage to his elbow. Seager has been one of the most impactful players for the Dodgers the past two seasons, including his Rookie of the Year season in 2016. Last year, he hit .295 with an OPS of .854. Through the first month of the season, Seager has hit .267 with an OPS of .744. After a sluggish start, Seager has kicked it into gear over the past couple of weeks. He was undoubtedly going to be a huge part of the Dodgers trying to climb out of the early hole they dug for themselves early in the season. For the time being, Chris Taylor will shift from center field to shortstop. Taylor played primarily shortstop throughout his minor league career. But his breakout season last year came as a member of the Los Angeles outfield. However, Taylor is also off to a slow start this season, hitting just .233 with an OPS of .698. To make matters worse, both Justin Turner and Logan Forsythe are currently on the DL. With Seager also going to the DL, the Dodgers are currently without 75% of their projected infield heading into the season. Enrique Hernandez is also an option at shortstop with Seager out. However, he’s likely to see a significant amount of playing time in center field with Taylor moving to shortstop. Later in the season, Zaidi says the Dodgers could be in the market for a shortstop. But for the time being, the Dodgers will have to replace Seager internally. Considering how much Seager has meant to the Dodgers the past two seasons, that won’t be easy. For a team that finished April under .500, the road to the top of the NL West just got a lot more difficult.